Roach Party! is a complete game with 16 custom made dice, a dice bag, and rule book all enclosed in a clear clam shell package, everything you need for hours of fun! This package contains 16 custom made dice, rulebook, and dice bag - everything you need for hours of fun! When zombies attack, you don’t have to outrun the zombies...you just have to outrun your friends! Bust the door, fight the monsters, take the treasure. Dungeon delving has never been this much fun and easy. Dungeon Attack! is a fast-paced, cooperative dice game where you and your friends venture into an ancient dungeon encountering monsters and searching for treasure. This package contains 16 custom made dice, a dice bag, four adventurer cards, 32 treasure tokens and the rules – everything you need for a fun, quick game! Do you have everything else for Dungeon Attack! but really want the Artifact & Magic Item Cards for your game? Well, here they are. In this pack you get 2 Artifact Cards and 8 Magic Item Cards. These cards may be used instead of tokens to represent magic items and artifacts found during play. Finally, the demo play mats seen at conventions and much sought after are now available for sale. 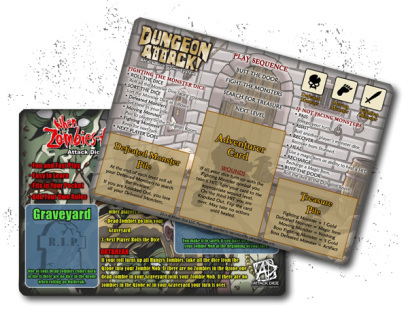 These mats are double-sided with Dungeon Attack! printed on one side and When Zombies Attack! on the reverse side. The mats are not essential for play but they have the summary of the rules printed on them, they keep your dice organized, and they are cool to look at. These mats come six in a pack and are made of heavy stock with a glossy finish and rounded corners. Shadow Hunter, and the Valiant Valkyrie. In addition, four adventurer followers are included along with the optional rules card detailing their use in the game: the Torchbearer Peasant, the Mercenary Sellsword, the Dire Wolf, and the Nurturing Spirit. Spice up your Dungeon Attack! games by using these themed dungeon cards. Each of the six cards in this pack contains rules that modifies the game. This way every game is slightly different. There are two ways to use these, randomly pick one for each dungeon level or pick one dungeon card and use it for all the dungeon levels. Dungeon Attack! Acrylic Tokens - OUT OF STOCK! Upgrade your Dungeon Attack! tokens with these high quality laser cut acrylic counters, designed by us and produced by Impudent Mortal. In this pack you will find the same quantities of tokens as in the game: 16 One Gold, 8 Five Gold, and 8 Magic Item tokens. The different sizes and shape makes it easy to tell apart as well as ideal for candlelight or low light adventuring. Dungeon Attack! Event Dice - OUT OF STOCK! Bump up the challenge of your Dungeon Attack! adventures with the addition of these two event dice. With the Trap Die, each time a player Bust the Door there is a chance a trap is triggered. With the Labyrinth Die, each time a player Bust the Door, there is chance the adventurer has wandered off and is lost. That is why it is a good idea to never separate the party. This pack contains two event dice and their respective optional rules cards. Dungeon Attack! Chaos Dice - OUT OF STOCK! 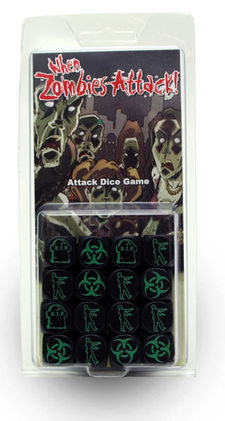 Include these dice in your Dungeon Attack! games to battle against the taint that is chaos. 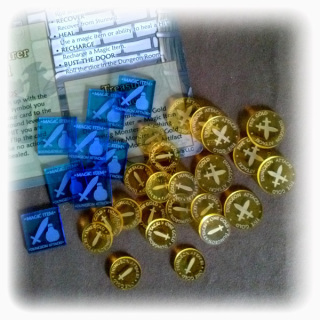 This set contains x4 Chaos Dice and rules card. In game play a chaos hit taken taints the Adventurer preventing him or her from using any magic items. Ouch! Defeat these agents of evil quick before they weaken your group of heroes. Dungeon Attack! Poison Dice - OUT OF STOCK! Need more challenges? Try adding these Poison Dice into your next Dungeon Attack! game. This set contains x4 Poison Dice and rules card. In game play each poison hit taken lowers an Adventurer's Combat Raing by 1. So stay away from these poisonous critters or defeat them before they get you. Dungeon Attack! KOed Dice Bag - OUT OF STOCK! This is the perfect carrying case for your Dungeon Attack! game with enough room for multiple dice packs and adventurer cards. KOed’s dice bags feature the Dungeon Attack! logo embroidered in deep yellow, a deep 3.5” square main section which will hold 100 16mm dice (and a few more) and stand upright so your dice don’t fly everywhere! They also include an elastic strap to hold a pen and an elastic strap inside perfect for storing cards. Finally, each bag is fully reversible so you get two bags in one!